"No one will ever persuade me that the war could not have been ended long ago. The Emperor Karl offered peace. There is the only honest man who occupied an important position during the war, but he was not listened to. In my opinion his offer ought to have been accepted. The Emperor Karl had a sincere desire for peace, so everyone hates him." 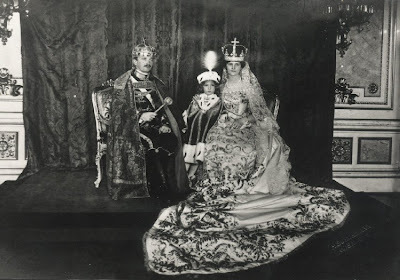 On 1st November 1921 the Austrian Emperor and Hungarian Karl and is wife Empress-Queen Zita were taken aboard the British monitor HMS Glowworm, and removed to the Black Sea from where they were transferred to their final exile, the Portuguese island of Madeira. Determined to prevent a restoration attempt, the Council of Allied Powers had decided to exile the Imperial couple to Madeira because the island's isolation in the Atlantic Ocean. Originally the couple and their children, who joined them on 2nd February 1922, lived at Funchal at the Villa Vittoria, next to Reid's Hotel, and later moved to Quinta do Monte. Emperor Charles should not leave Madeira again. On 9th March 1922 he caught a cold walking into town. Since he could not afford a doctor, he delayed calling for medical aid, and his sickness became worse. He developed bronchitis which subsequently progressed to severe pneumonia. 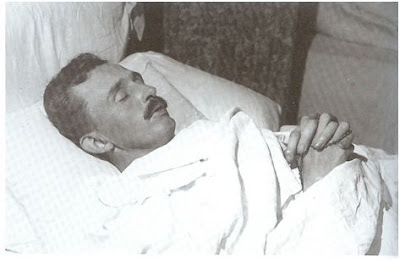 Having suffered two heart attacks he died of respiratory failure on 1st April in the presence of his wife, who was pregnant with their eighth child and nine-year-old Crown Prince Otto, retaining consciousness almost to the last moment. His remains except for his heart are still kept on the island, in the Church of Our Lady of Monte, in spite of several attempts to move them to the Capuchin Crypt in Vienna. His heart, and that of Empress Zita, repose in the Loreto Chapel of Muri Abbey. Pope John Paul II declared Emperor Charles "Blessed" in a beatification ceremony held on 3rd October 2004. As soon as he succeeded to the throne, Ven. 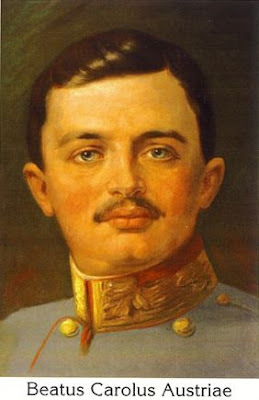 Emperor Karl bent his energies to seeking the end of the carnage of World War I, which had been raging for two years. To that purpose he authorized a brother-in-law, Prince Sixtus of Bourbon-Parma, an officer in the Belgian army, to deliver a set of peace proposals to president Poincaré of France. As testimony to the sincerity of his effort, the Emperor stipulated his readiness to sacrifice his hereditary claim to Lorraine and to cede to Italy the Italian ethnic portion of the Trentino, even though Austrian troops at the moment were well advanced into the northern part of the Italian boot. In a Peace Note of 1st August 1917, Pope Benedict XV seconded Karl’s initiative. Both the Pope and Emperor foresaw that unless the war was quickly ended, the unstable Kerensky government that had taken power in Russia in March 1917, could degenerate into something far worse because it would be far more threatening than imperial Russia ever was to what remained of Western Christendom. This is to speak of the Austro-Hungarian Empire in terms of what it was: the last Catholic world power. Unfortunately, Austria’s Western enemies of the moment, who were looking for U.S. intervention to enable them to achieve territorial and other ambitions, were not ready for peace. At the same time Karl’s own ally, the Kaiser Wilhelm II of Germany, hoped to beat England and France on the Western Front before effective U.S. aid could arrive. The war continued. It produced great deprivations on the home front. The poor were especially hard hit. In his capital of Vienna, Karl ordered that carriages and coaches of the imperial court be used to deliver coal to them. Further, he established a new Ministry of Social Welfare in his cabinet and gave its portfolio to the redoubtable Msgr. Ignaz Seipel, an apostle of reforms based on Pope Leo XIII’s Rerum Novarum and other papal social encyclicals. Karl also acted to restructure the Empire politically along federalist lines. Establishment of a kind of United States of Greater Austria was his aim. In a manifesto of 16th October 1918, he ordered each ethnic group in the Imperial Parliament to caucus and draw up a plan for the government of its portion of the Empire. These were excellent and desirable moves. However, powerful forces were working against Karl, forces within the West itself, forces which had their agents even inside the Empire. 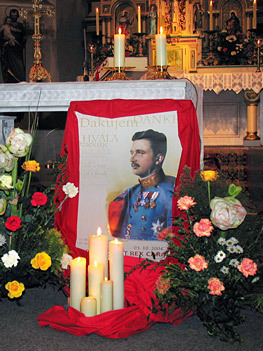 The head of Austria's Imperial Family, Archduke Karl, and his brother, Archduke Georg, visited their grandfather's coffin. They were accompanied by Dom Duarte, Duke of Bragança.